It's been six years since we drove in late July/early August to Yellowstone NP and other western points. How do the years escape like that? Here are Lilly and Ann, looking a lot smaller, on the banks of the Gardner River, a tributary of the Yellowstone. Then I turned and looked southward at the river. The current was gentle, and we were able to wade into the river, which was shallow and rocky at this point. As I discovered by spotting a US Geodetic Survey marker nearby, we were only a few feet north of the Montana-Wyoming state line, which is also the 45th parallel of latitude north. This is the venting, sulfurous Yellowstone famed in tourist lore. I think I took this shot at the Norris Geyser Basin, which is traversed by long boardwalks, with plenty of signs warning visitors not to stray onto the terrain or risk being boiled alive. Less hellish is the cool Isa Lake, a small body of water in the park with the distinction of straddling the Continental Divide, which at that point has a elevation of 8,262 feet. Isa Lake (wouldn't Lake Isa sound better?) thus drains into both the Pacific and Atlantic oceans. According to Wiki, citing pages I can't access tonight, "the east side of the lake drains by way of the Lewis River to the Pacific Ocean and the west side of the lake drains by way of the Firehole River to the Atlantic Ocean. This is the opposite of what one would expect, since the Atlantic Ocean is east of the lake and the Pacific Ocean is to the west." No organized activities for my children this summer, except for the sporadic times I dropped Ann off at a park district games-and-swimming program that ran from early June until last week. It involved low fees and no commitment, so barely counted as organized. But the girls are entertaining themselves. Too much Wii, maybe, but that's just the opinion of someone whose most recent video game interests were Space Wars, Space Invaders, Galaxian, Pac-Man and Donkey Kong. Other activities have surfaced for them as the summer goes on. Yesterday Ann took a sudden interest in buoyancy, filling up a large metal bowl with water and testing objects to see if they would float. When her search for new objects brought her into my office, I suggested she take notes of what floated and what didn't. So she did, on a single post-it note. I have it in front of me now. Floats: an aluminum-foil boat, a rubber ball, six peanuts in their shells wrapped in plastic wrap, Lego pieces, pencils and some other small plastic items. Does Not Float: all coins tested, even aluminum ones, a Spongebob plastic figure, a plastic ring, a rubber ring, two metal rings, a paper clip and something that I can't decipher that looks like "small moron," though I don't think that's the correct reading. Lately Lilly has been using cake mixes to make various cakes, topped with icing she makes from recipes she finds on the Internet, along with improvisation. She's been making some good stuff, too. One of her icings included sugar, confectioners sugar, butter, cocoa powder and Mexican chocolate -- that last one was added to the recipe, I think -- and boy was it good. She's promising other forays into cooking in the coming days, such as fried chicken for dinner using a select assortment of seasonings in the batter. I expect that'll be tasty as well. Huge thunderstorm on the horizon during mid-morning today, the dark and ominous kind. Then it mostly bypassed us here in the northwestern suburbs and slapped other suburbs. But as the current headline at the Tribune Weather Center asserts, "Heat & humidity set the stage for storms this morning and a heavy rain event tonight." So we'll get another chance. Nothing like a heavy rain event to perk one up. If I haven't learned something new, it's been a wasted day. Luckily, something new doesn't mean something insanely difficult or arcane, like the Krasovskii-Lasalle principle, even though that has its own Facebook page. Still, the thought of arcane mathematics naturally leads to this, which is a discussion of the analytic and algebraic topology of local Euclidean meterization of infinitely differentiable Riemannian manifolds. Instead, I learned that the Indian rupee has a relatively new symbol, adopted only last year. I didn't know that before, and don't have any fonts for it, so interested parties will have to look here. Not bad. Looks like a municipal rail symbol -- Mumbai Metro, maybe, which is now under construction. But it makes a decent currency symbol as well. Buckets of work just now. That's good, of course. I even interviewed the president of a retail chain that I frequent sometimes, which was interesting. But today was a crummy day for working. It would have been a much better day for reading on the deck or walking on a lush suburban trail, since temps were only warm, not hot. Recently I acquired a box of Just The Basics™ brand frosted flakes for a scant 75¢. Product of Poland, for those keeping track. What are the basics in the frosted-flake realm? Corn, sugar, salt, barley malt and lecithin, according to the ingredient panel. Guess I'm a sucker for third-string dry sweetened cereals. Besides, not long ago I got a 20.5-oz. box of Kellogg's Frosted Flakes on sale for $2.50. The Just the Basics box weighs 6 oz. So I paid 12.19¢ per ounce for Kellogg's but 12.5¢ per ounce for Just the Basics, not including sales tax for each. Not only that, the basics do not include a cartoon mascot whose fame transcends national boundaries. Late last week Mary Hikade of Grand Rapids, Mich., died. I only met her once, at the wedding of my nephew Sam and his wife Emily, but she seemed like a kind and gracious lady. She was Emily's mother, passing away at only 63. Her obituary in the Grand Rapids Press is here. RIP, Mrs. Hikade. It's been dry for weeks around here, but as if they'd been scheduled in advance, big storms came Thursday, Friday and Saturday nights, following roughly the same pattern. Late in the evening, far-off lightning. Then the low rumbling of thunder. After midnight, loud thunder and lightning and some rain, how much depending on the day. Saturday, it turned out, set a record rainfall for the Chicago area on a single day, as measured at O'Hare: 6.86 inches, with all of that falling in the wee hours. The last time it rained nearly that much, in 2008, we got this. There wasn't that kind of accumulation this time in our immediate area, but some other parts of metro Chicago got too much of a soaking, I hear. Tucked away in a corner of a shelf in one of our bedroom closets is my tattered t-shirt collection. It features tees that I used to wear, but whose condition would make wearing them embarrassing now. Yet they have sentimental value, often as reminders of places I've seen, such as the one sporting the Hong Kong coat-of-arms, or the colorful Maui shirt, or the yellow shirt with black letters that say, "Eat, Drink and Be Merry, For Tomorrow You May Be in Utah." Most prized of all is my New Orleans shirt. I acquired it shortly after the 1981 visit to that city that I mentioned on July 10. Kevin Middleton, one of my traveling companions, was on his way to becoming a graphic artist even then. After we got back, he designed and silkscreened five shirts with the same image to commemorate our visit. I think he kept two, and gave one each to the three other people on the trip. This is mine. 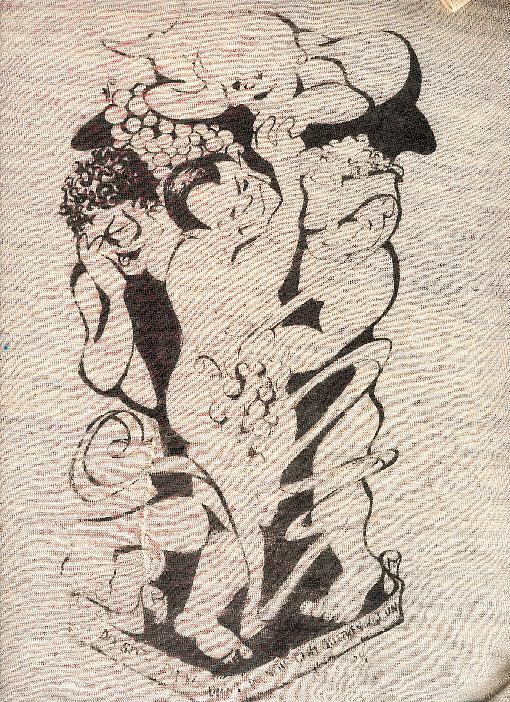 It's faded after three decades, and scanner doesn't really do it justice anyway. Kevin is the central, Pan-like figure with pointy ears. Artist's prerogative, I figure. 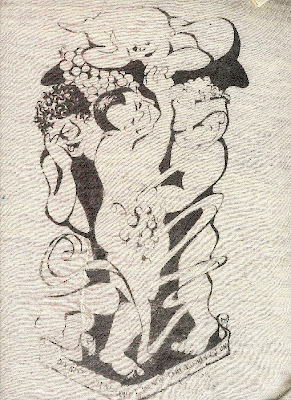 He's holding hands with Nancy at top, who is bald and has a mermaid's tail. To the right of Kevin is Tom, blindfolded and reaching for a bunch of grapes. I'm to the left, looking demented. It all suggests a bacchanal. Spelled out at the bottom, in French, is "July Sixteenth to July Nineteenth, Nineteen Hundred Eighty-One." It's the time of the year again to turn our eyes to the Moon for a moment and ponder humanity's furthest expedition to date, even as the achievements of 30 years of Earth-orbiting Shuttles are considered. 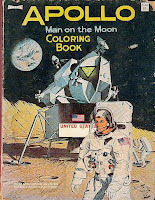 Around 40 years ago, my mother bought me Apollo Man on the Moon Coloring Book, and last year I was astonished to find it at her house, its pages yellowing and its edges frayed, but otherwise in fairly good shape. I brought it back with me to Illinois. The copyright date, unsurprisingly, is 1969. It's a product of the Saalfield Publishing Co. of Akron, Ohio, and cost my mother 29¢ (about $1.60 now, adjusted for inflation). A subhead says, "Based on the National Aeronautics and Space Administration Program." According to Kent State University, which now owns the company's library and archives, Saalfield "published children's books and other products from 1899 to 1977 and was, at one time, one of the largest publishers of children's materials in the world." Wiki continues: "During its flourishing, the company published the works of authors including Louisa May Alcott, Horatio Alger, P. T. Barnum, Daniel Defoe, Colonel George Durston, Laura Lee Hope, Herman Melville, Dr. Seuss, Anna Sewell, Shirley Temple, Johanna Spyri, Mark Twain, Johann Rudolf Wyss, and Robert Sidney Bowen." 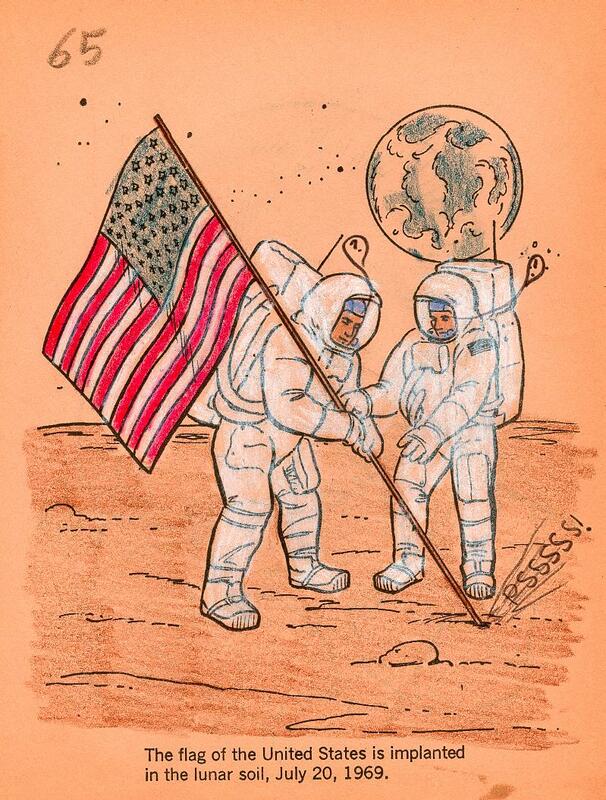 And also published the works of anonymous staff artists who drew coloring pages about the Apollo program. When Saalfield went out of business in 1977, Kent State acquired what was left. The university now has 171 record storage boxes + oversize, 175 cubic feet, of material produced by the company. "This inventory is limited to a group of cloth books, picture puzzles, paper dolls, and a variety of activity books," the inventory web page says. "The cloth items include children's books, banners, and promotional materials. Among the activity books are coloring books, follow-the-dot books, pasting and sticker books, wet-a-brush, rub-a-pencil, and stencil books, and sewing cards. Of special interest are a number of Shirley Temple items including authorized editions of paper dolls (including one 32" tall), coloring books, sewing cards, and other activity books." Quite an operation in its day, but now not even a ghost of a memory except to a number of collectors and archivists. 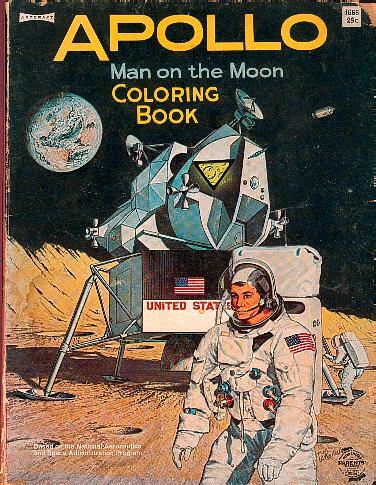 I checked the listing, and Kent State does not seem to have a copy of Apollo Man on the Moon Coloring Book. I doubt that they or any collectors would want mine, since I used it for coloring. Which was, you know, its purpose. I don't quite understand the fetish of mint-condition collectibles. You might call the book's style Coloring Book Realism. Each of the 96 pages (three 32-page forms? probably) is briefly captioned, only one sentence per page, but still manages to contain a fair amount of information about the Saturn V, the CM and LM, the astronauts, their equipment and a step-by-step description of the journey to the Moon. 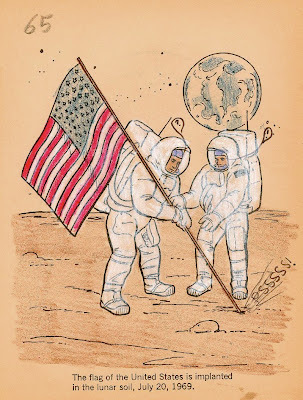 Curiously, the term "Apollo 11" is never used, though "Columbia" and "Eagle" are mentioned once, and the date of the first moonwalk is specified, so there's no doubt which mission is depicted. Also, none of the astronauts are named, and none of them quite look like Armstrong, Aldrin or Collins -- they're more generic clean-cut astronauts. Must have been a way to avoid any licensing entanglements. President Nixon, however, does make an appearance in name and visage, talking to the astronauts on the phone. I colored some, but not all, of the pages. And added some comic relief. Elsewhere, the astronauts have pointy goatees, green teeth and a few other added details. I took my camera to the zoo last week, but didn't have much luck capturing any decent images of any animals. I didn't even get a good shot of the zoo's relatively inanimate Roosevelt Fountain. The fountain, according to the zoo web site, "honors one of the country’s most enthusiastic conservationists: President Theodore Roosevelt. Alfred Hamill, founding trustee, was the guiding spirit behind the creation of Roosevelt Fountain, which was dedicated on May 14, 1954, in the presence of some 700 dignitaries. "Prior to the celebration, Sylvia Shaw Judson, noted sculptress and wife of then Chicago Zoological Society president Clay Judson, created four statues that still stand today as symbols of the President’s character: statesman, naturalist, hunter, and soldier." I need to give those statues a closer look sometime, since I think they're the ones ringing the plaza whose focus is the fountain itself. They aren't statues of the president himself -- I would remember that -- but I can't remember exactly what symbols Judson used. A riot of gorgeous flowers surrounds the fountain this time of year. Lilly was able to capture it. I think those are coneflowers. The fountain is barely visible in the background, but who cares. The original image reminds me of a picture for some glossy, photo-heavy calendar. Lilly also hand her hand at some animal pics, and came away with some good shots. Such as a small tower of giraffes. I took at least one pic that I like, if only for sentimental reasons. My family in front of the penguins. I took that pose because I remembered another photo I took, similar in background, but when my family was a little smaller than it is now. 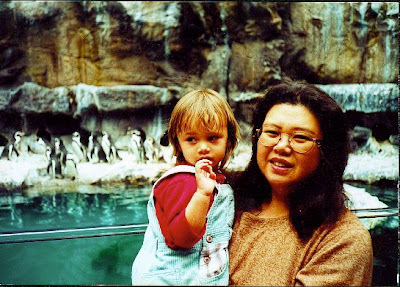 Yuriko and Lilly and the Brookfield Zoo penguins, circa 1999. Hot days this week, but at least the dogday cicadas have returned to Illinois to buzz during the late afternoon and early evening. I try to time my book reading on our backyard deck to be late enough to avoid the worst of the afternoon heat, but not so late that I'm mosquito food for the dusk-time bloodsuckers. I also sometimes go out after dark and read by porch light and look for fireflies and listen for crickets. They're ramping up now. I expect much louder cricketsong as the weeks go on. The Brookfield Zoo has added some features since we were last there. It's good to know that the economy hasn't kept a nonprofit like the zoo from capital investments such as the Great Bear Wilderness, 7.5 acres that, according to zoo, feature "iconic North American animals: Grizzly Bears, Polar Bears, Bison, and Eagles." (Sic. Not sure why animals get caps.) The zoo moved the bears there from the former Bear Grottos, which are no more. The new space for bears is much larger than the grottos, the better for bears to be bears, I figure. The wolves also have a large new enclosure of their own, the Regenstein Wolf Woods. The resident wolves there were fairly active for such a warm afternoon, coming close enough to the viewing station to show their kinship with domestic dogs. A sign at the viewing station -- which is indoors -- promises a couple of minutes in a darkened room, listening to wolf calls. We couldn't pass that up. The room was indeed dark, except for the glowing EXIT sign, and the soundtrack began with crickets. Then the wolves chimed in, making quite a din. That confirmed that I heard coyotes in the distance those years ago while camping on national forest land in Montana on a cold August night. All four of us were wrapped in our blankets in our tent, but I was the only one awake to hear the not-so-distant baying of coyotes. Later I thought maybe they were wolves, but apparently wolves howl more than coyotes, who yip and yap more (not that I've ever heard that in the suburbs, though I know coyotes live around here). We also visited exhibits that have been around a while, such as Fragile Desert and Fragile Rain Forest, though I had to wonder about the fragility of environments that would kill me quickly if I ventured there unprepared. Pinniped Point has seals and sea lions, while The Swamp has alligators, otters, snapping turtles and signs warning us not to buy cypress mulch for our gardens, since cypress trees need to stay in swamps, not be cut for purpose of lawn vanity. I'll go along with that, partly for environmental reasons, partly in my quest for a low-maintenance, biodiverse lawn. The Living Coast has long been a favorite of mine at the Brookfield Zoo. It has penguins, for one thing. It also used to have a large tank of moon jellies. Now there's only a few in a small tank. Or maybe I'm misremembering things. Maybe the Shedd Aquarium has the tank of moon jellies. But I could have sworn that five or ten years ago the Living Coast had an enormous tank with dozens and dozens of the creatures, a real smack of jellies, meandering around their water unconcerned whether they were in Tethys Ocean or an artificial pool built by land-dwelling primates who, in jellyfish terms, are very recent arrivals. I assume they're unconcerned. It's impossible to tell. I quote from Wiki: "Jellyfish do not have specialized digestive, osmoregulatory, central nervous, respiratory, or circulatory systems." That's a lot of things not to have. They seem so otherworldly, so ethereal. Yet there they are, moving around placidly like they have for maybe 500 million years. I found this picture in a box of mostly '50s and early '60s black-and-white images at my mother's house last year. 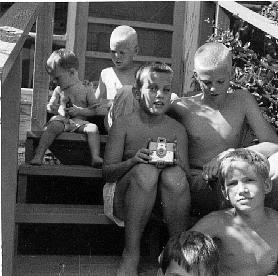 I'm the one sitting on the stairs to the left, the smallest boy in the picture, wearing only shorts. It gets pretty hot in North Texas during the summer, after all. I was a little younger then, just two years old, because according to the information on the back of the print, the photo was taken by my father on July 20, 1963. The date is significant because there was a solar eclipse visible from much of North America that day -- a partial eclipse from our vantage. According to my brother Jay, 11 at the time and holding a camera in the picture, it was a highly publicized event. Naturally I have no memory of it. This NASA map shows that totality was visible mostly in Canada, but also in parts of Alaska and Maine. Curiously, the eclipse figures in "Seven Twenty Three," a third-season episode of Mad Men. When Don Draper's daughter and some other school kids are out looking at the eclipse through camera obscuras that a teacher, the fetching Miss Farrell, helps them make, it's a chance for Don to eye Miss Farrell more closely than the eclipse. Fictional characters weren't the only ones using camera obscuras that day, it seems. I've experienced a couple of partial solar eclipses that I do remember: one on March 7, 1970 and another on May 30, 1984. 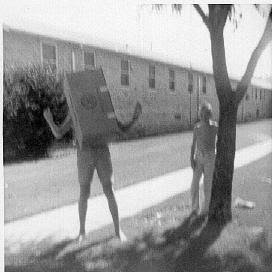 In 1970, I made my own camera obscura, which worked well enough even though the day was partly cloudy in San Antonio. Before I went inside, I had to see the thing with my own eyes, despite being warned ad nauseam against it. I glanced upward for an instant and my timing was perfect. I saw the bright disk of the Sun, the dark disk of the Moon, and clouds rolling past them, all in a fraction of a second. No harm done. In 1984, North America experienced an annular eclipse. I worked part time as a proofreader for a publisher in Nashville in those days, and all of us in the proofreading ghetto noticed a distinct dimming of the daylight. We were in a single-story office building, so we spilled out into the parking lot for a few minutes. The sky was clear and this time I didn't look at the solar or lunar disks. But I didn't need to for the full experience. It was the strangest daylight I've ever seen, as if a dimmer switch had been turning down the Sun. With any luck this will soon be just an amusing comment from an uncertain period in U.S. history, not a bitter reminder of the cheerful summer days before the Panic of 2011. Today I had an encounter with a meat product that purported to be frozen "beef" patties. Obtained at a nearby discount supermarket chain, they were frozen all right, and in patty shape. They cooked up like hamburger, too -- greasy hamburger. Truth be hold, they weren't all that bad, but then again I have a high tolerance for mediocre food, and these patties fell squarely in that camp. Just how much beef we were getting is an open question. I quote from the ingredients: beef, beef hearts, water, textured vegetable protein (soy flour), soy protein concentrate, seasoning (flavors, salt, mono-sodium glutamate [Argh! I feel the headache even now! ], sugar, turmeric extractive), salt. Beef hearts, as in captain. I have to like that. The squeamish might object, but I say parts is parts. Still, why do the hearts have to be labeled separately, since heart is really just a muscle, like much of the rest of the animal we're eating? Also, why is salt listed as a seasoning parenthetically and as a main-line ingredient? Somewhere in the bowels of the FDA there might be answers to these questions, but that would mean unpaid research, so I'll let it go. The bigger question remains -- how much beef? To quote Steven Colbert on Taco Bell earlier this year: "It is beef-y. Or beef-ish? At the very least it is beef-adjacent. Let me put it this way: On a scale of one to beef, it's got something in there." It's as if World War II never really ended, and beef + extenders cost fewer ration points than 100 percent beef. And they'd be called Victory Burgers. Hot weekend. But it should be here in the Northern Hemisphere, considering that the calendar says July. I spent some time roaming the vast aisles of a certain do-it-yourself warehouse retailer one day recently, looking for this and that, but mostly looking at this and that. In the men's room of this particular store, I noticed that both of the urinals and one of the three sit-down toilets had OUT OF ORDER signs taped to them. And where is the one place that broken toilets should be fixed quickly? A do-it-yourself store. Yesterday's posting, which is also posted on Facebook, got a fair amount of attention on that social media site, mostly from my old friends who are in the picture. But one friend of a friend asked if, indeed, that was a bottle of 7Up on the table. It was a liter bottle, I think, in a style that's probably long gone, though I haven't examined any glass 7Up bottles lately. It just seems likely that a design available 30 years ago wouldn't be available any more. That bottle called to mind this commercial, made in 1974 and aired for some time afterward. Everyone in the room with me that day in 1981 would have seen it any number of times. Watching it again after so many years, I'm taken with the luminous artistry of the thing, created by the fine blending of '20s and '70s styles, visually and musically. What to call that? Psychedelic deco? I'm sure I didn't appreciate it when it was new, as with so many things. More on the commercial's director, the late Robert Abel, is here. He went on to be a computer animation pioneer, among other things, and seems to have gotten a Clio for his efforts on the "Bubbles" commercial. I hope so. More on 7Up is here, from Snopes, of all places. Career consultants and their ilk say never to post pictures of your drunken self on the Internet, but I'm going to ignore that advice. 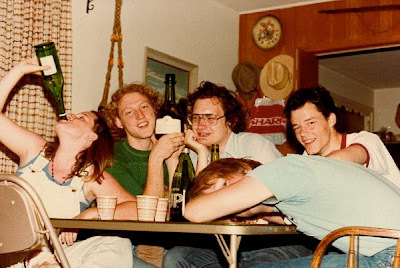 Besides, after 30 years I'm not sure just how much I'd had to drink on the night of July 12, 1981, at my home in San Antonio in the company of some of my high school friends, two years after finishing school. Probably not that much, all things considered. I look pretty giddy, though. We had reason to be giddy. Four of us -- three in the picture, and the fellow taking it -- were planning to visit New Orleans later that week. And so we did, leaving on the 16th. Now that was a time. Not long ago I got an e-mail from a site that publishes short how-to articles, among other things. It's a fine site, full of useful information. But I wasn't especially persuaded by the article the message linked to, "How to Make Aloe Shaving Cream." It began, "Moisturizing aloe and peppermint shaving cream is a simple, natural alternative to the expensive store-bought shaving creams that are often loaded with unnecessary and potentially harmful additives and preservatives." No kidding. I've been shaving my face more than 30 years now with expensive store-bought shaving creams and one of these days I'm going to wake up dead because of potentially harmful additives and preservatives. Cheerful news. So how do I concoct a simple, natural alternative, one probably used by the Indians of the Orinoco? According to the article, use distilled water, borax powder, coconut oil, liquid lanolin, some grated beeswax, almond oil, peppermint essential oil, and finally aloe vera gel. Then there are five steps involving two different sauce pans and some mixing. That isn't my idea of simple. Or inexpensive, come to think of it, since obtaining all those ingredients is bound to cost a bit, and I suspect some of it would go to waste, once I got tired of the sauce pans and the mixing. Call it the Real Simple syndrome. I only have a passing familiarity with that magazine/web site -- I'm way out of its demographic -- but it strikes me as devoted to ways to keep busy doing things that don't need to be done. Such as mixing up my own shaving cream. I suppose there are shaving cream enthusiasts who enjoy the process of making their own, like beer hobbyists or the like, and I wish them well. As for me, I can't remember what I paid for my most recent can of shaving cream, but it wasn't much (or I'd remember it). The thing lasts for months. It smells pretty good. I don't have to think about it or do anything about it while it sits in the bathroom, waiting for me to shave. That's my idea of real simple. As for the scary chemicals, I'll just have to live with the risk that my jaw will drop off someday. On July 4, the Fox River Trolley Museum was running two single-car trains. We rode on this one -- Chicago North Shore & Milwaukee No. 715 -- shown here on the weedy tracks at Castlemuir Station waiting to make its run to Blackhawk Station, about two miles away. According to the museum, the Cincinnati Car Co. built No. 715 in 1926 and it was in service on the Chicago North Shore & Milwaukee line until 1963. The car's a little worn, but otherwise in remarkably good shape. A labor of love by the museum's volunteers, I figure. The museum's caboose, one-time property of the Illinois Central, is also in fairly good shape, though there's no indication that it's still rolling stock. The inside is open for inspection. Not luxurious, but everything an early 20th-century trainman needed: bunks, a desk and chair, small stove, WC, water tank. The museum has maybe 10 other cars, including old CTA cars -- one not so old that I didn't ride in ones like it in the late '80s -- other passenger cars, box cars, and some very beaten-up refrigerator cars. The grounds, a slice of land between the road and a small park, also sported a couple of enormous sheltering oaks over the tracks. Grand old trees. They were probably here when the tracks carried interurban cars for real. I sat at the base of one of them while waiting for No. 715 to be ready for our ride because it seemed like a summertime thing to do. When the time came to ride old No. 715, this fellow took our tickets. He wasn't the conductor, not at least for our run. That job was handled expertly by a somewhat younger volunteer likewise dressed as a trainman of yore. No doubt driving trains has been a dream of his since he was a small boy. Plenty of meat and colorful explosions over the Fourth of July weekend this year for us, but not so much beer. I don't have what it takes to be a problem drinker, I guess, because I forget to drink alcohol. Days and weeks and months sometimes go by before I remember to take a drink. During the whole of the long weekend, it didn't occur to me once, despite my previous posting. As for the meat, I prepared that, but the explosions weren't of my own making, due to the misguided ban on recreational explosives in Illinois, which means that I'd have to drive further than I'd like to obtain fireworks. Still, the Westmont municipal fireworks, shot off last night over Ty Warner Park in that suburb, were worth the time and effort to get there. During the day we drove to South Elgin, Ill., to take a ride on a small remnant on the Aurora, Elgin and Fox River Electric Line that's now known as the Fox River Trolley Museum. It's a museum in the sense that it has artifacts -- train and trolley cars, mostly. It also has about two miles of track. Rides can be had on weekends and holidays during the summer, and on July 4 the rides are only a dollar. The AE&FRE was once an interurban line. Naturally that brings to mind the line in "Nellie the Nudist Queen" (Stuart Ross & John Sargent, 1933) -- the only song I know that uses the term "interurban." What, that's not the first thing most people would think of? Till a country guy came riding by on a ten-cent trolley tour! Beguiled poor Nell and took her back to his nearby nudist camp! Not to worry, since Nell thrived in her new setting, becoming the nudist queen of the title. Listen for yourself.